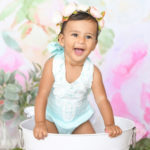 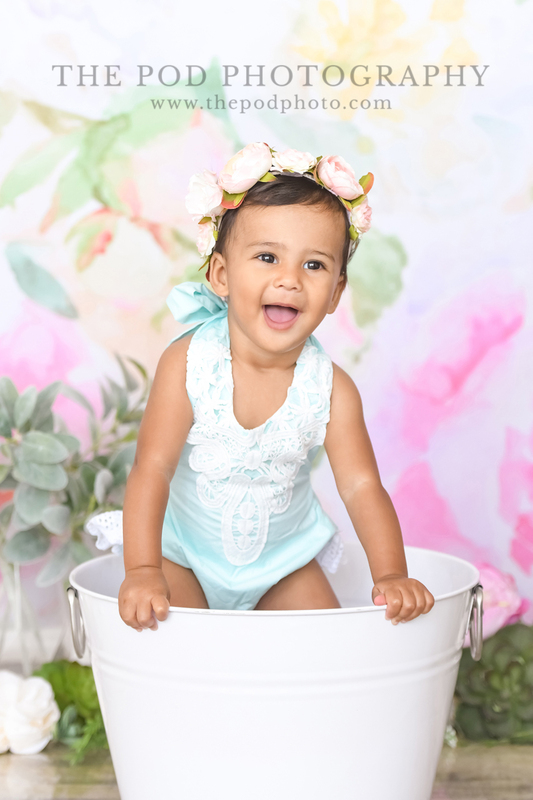 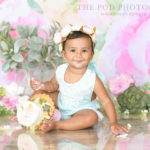 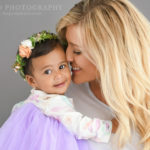 Westchester First Birthday Photography - Floral Boho Theme - Los Angeles based photo studio, The Pod Photography, specializing in maternity, newborn, baby, first birthday cake smash and family pictures. 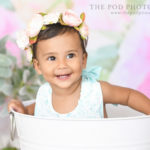 From the very beginning, we knew this Westchester First Birthday Photography session was going to be special. 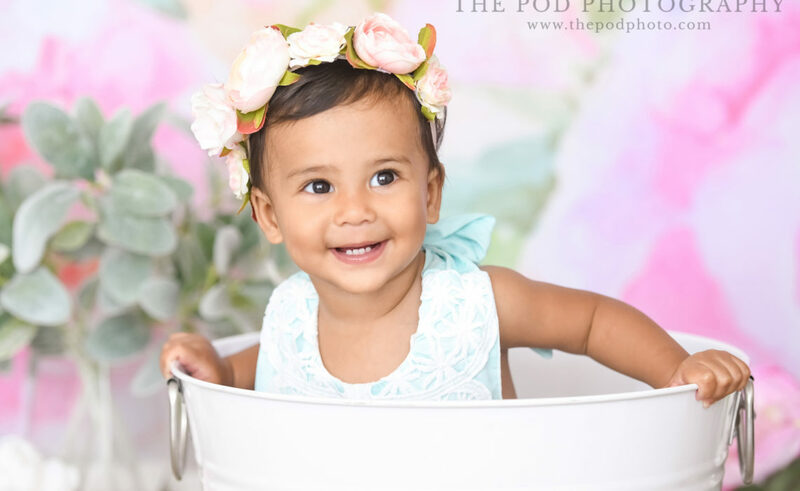 We first met with this PodMom about one month before her daughter’s big one year milestone. 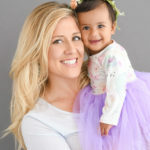 And from the first five minutes into our Design Meeting, we were just laughing, connecting and having a blast! 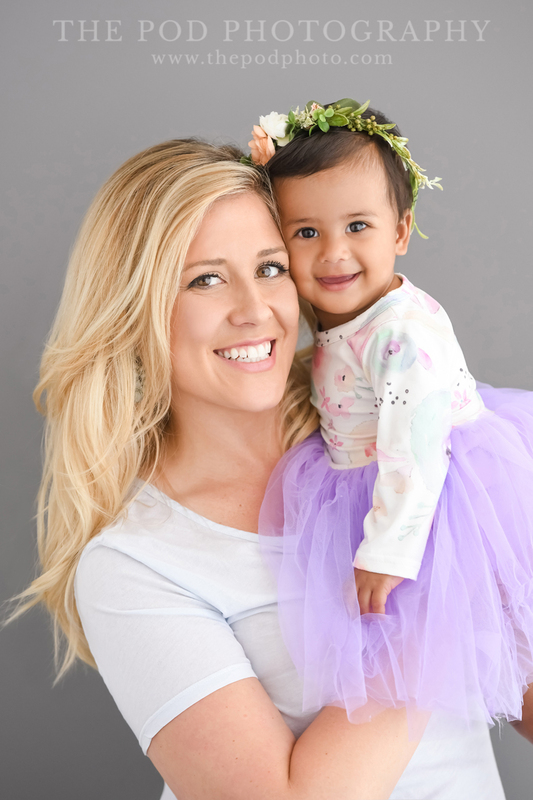 We got to know this mom, her story, and all about her beautiful little girl. 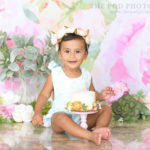 Come time for the (Westchester First Birthday Photography) session, we had all of her sets ready to go at our Portrait Studio! 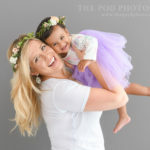 Mom arrived looking so beautiful, the we decided to take a few shots of the two of them first. 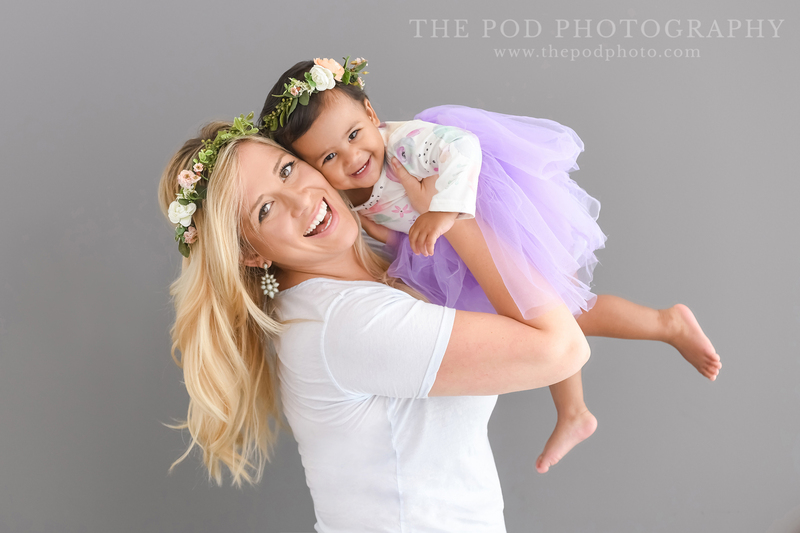 We even gave these two girls some matching Mommy & Me floral crowns. 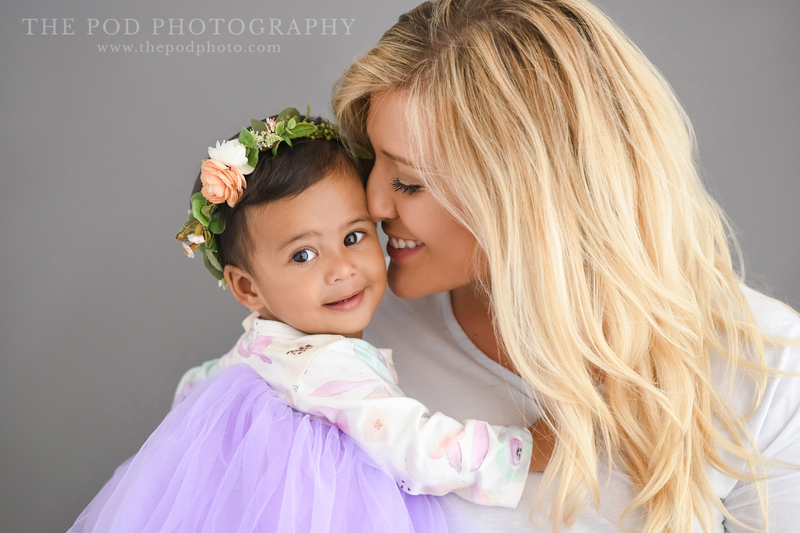 They looked so darn cute, we couldn’t even handle it! 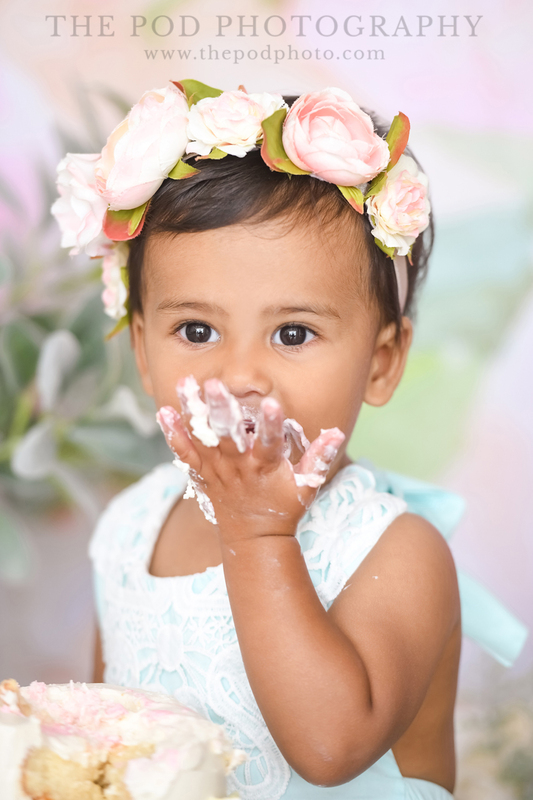 After Mommy & Me Portraits, it was time to give this baby girl some cake! 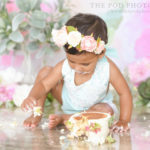 Knowing that Mom loves the bohemian vibe and lots of fresh flowers, we put together a beautiful boho floral cake smash set for her. 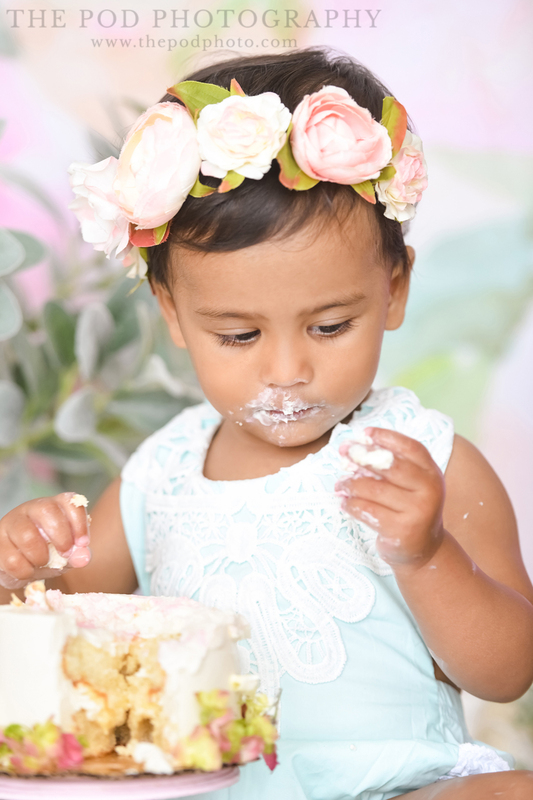 We absolutely fell in love with the Smash Cake. 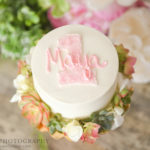 Each one of our smash cakes are custom designed by our favorite local bakery, Top Tier Treats. 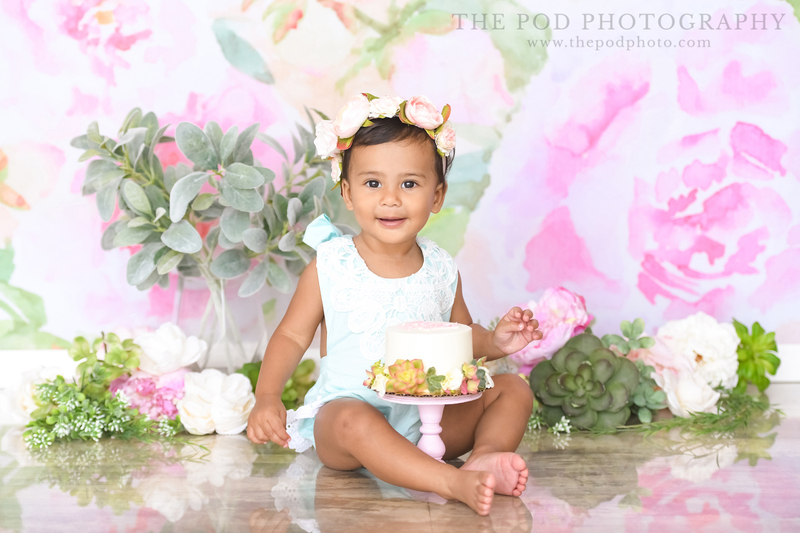 After lots of back and forth emails and phone calls, the owner created this gorgeous floral and succulent cake herself – just for sweet Baby Maya! 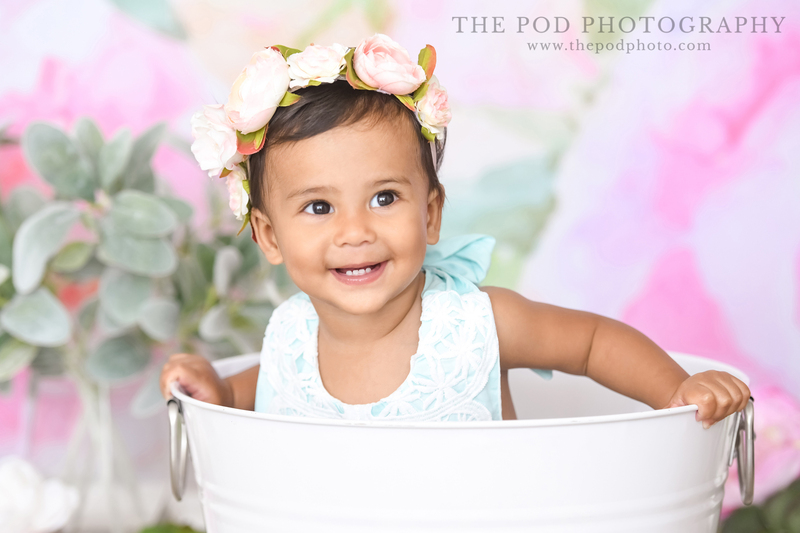 With Maya’s gorgeous skin complexion, this soft minty blue was the perfect color to pop against the different shades of pink! 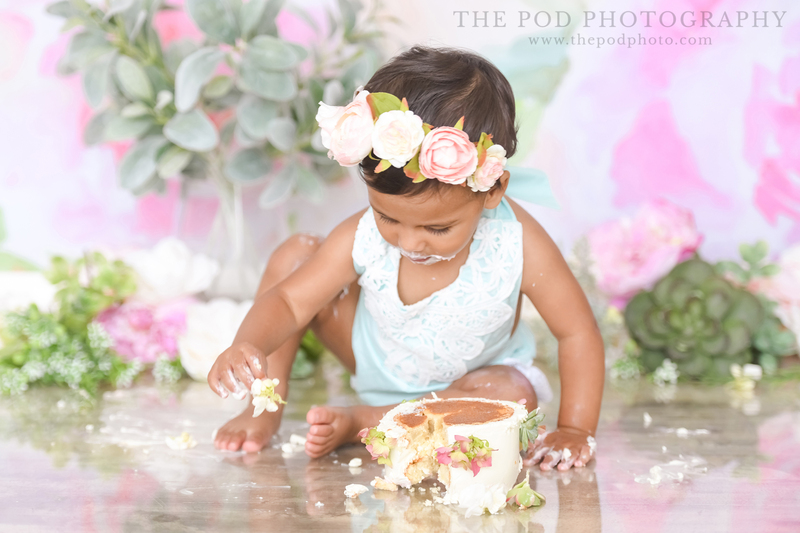 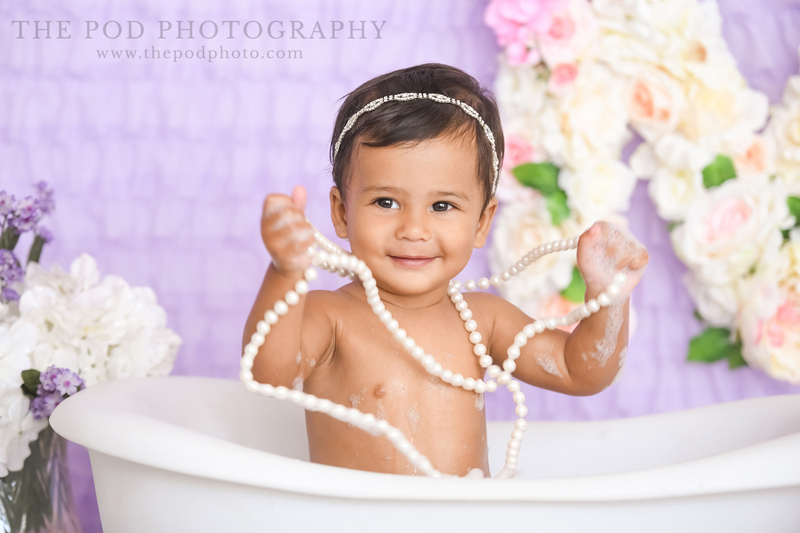 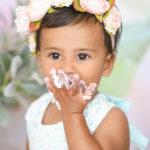 Take a look at some of our favorites from her Westchester First Birthday Photography cake smash portion of the shoot! 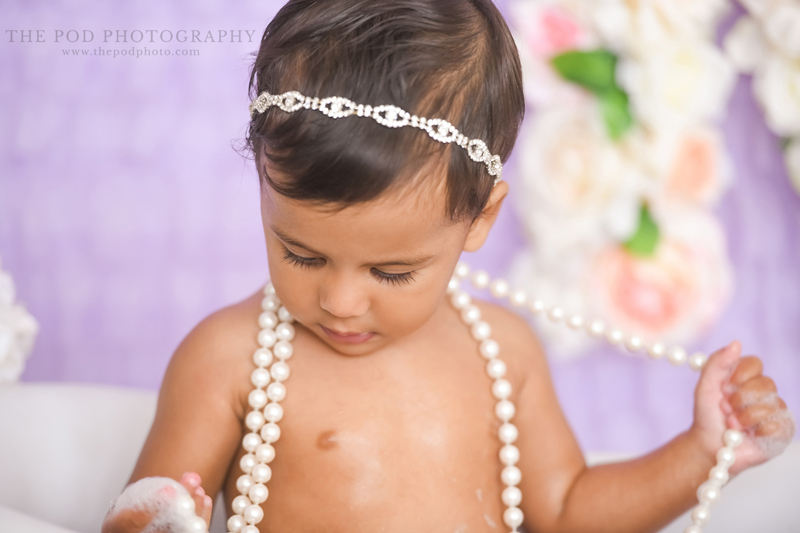 After getting all messy, of course we have to clean up! 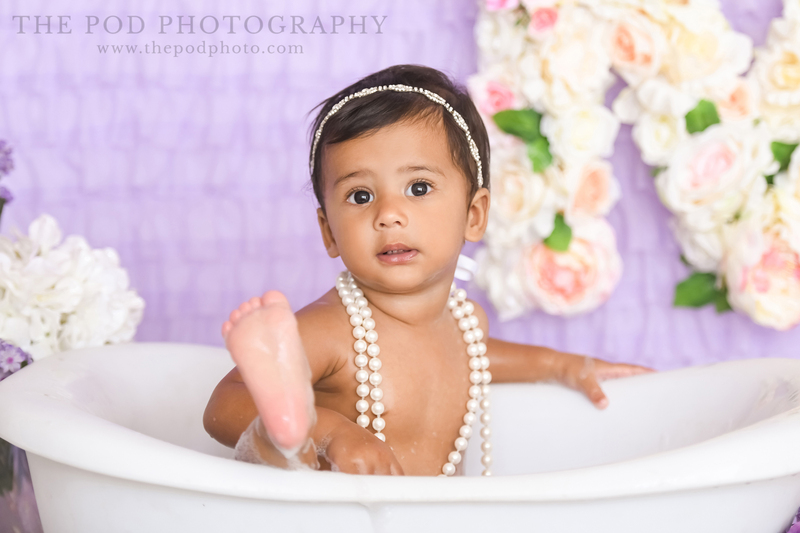 And what can be cuter than a miniature bathtub? 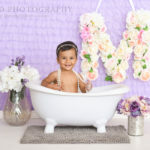 We were inspired by the purples from our Mommy & Me setup, and the florals from the Cake Smash setup. 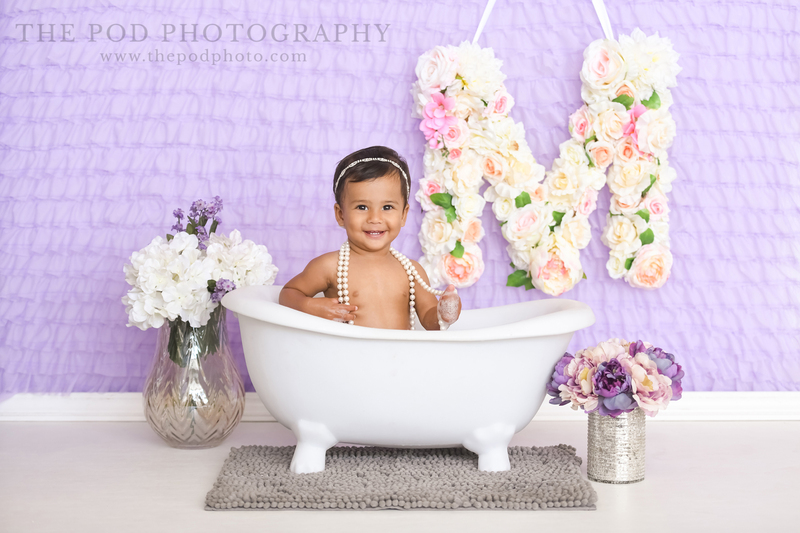 With those elements combined, this gorgeous purple ruffle background was the perfect setting. 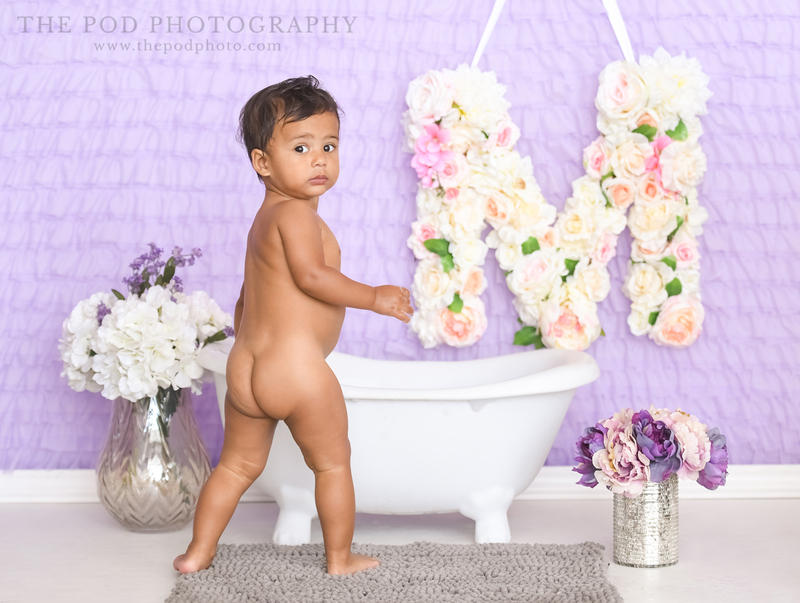 Especially with all of the flowers that Mom brought in! 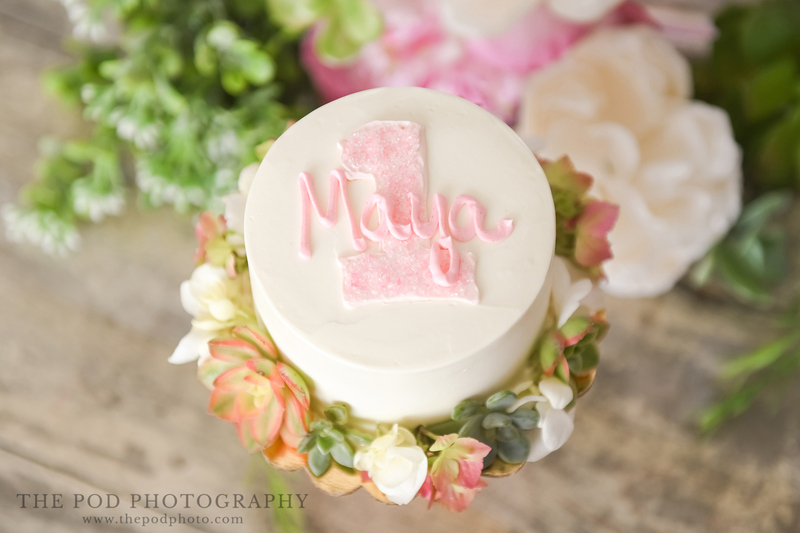 Including her big custom floral ‘M’ for ‘Maya’! 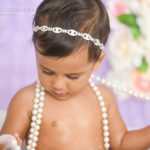 Overall, the styling for this Westchester First Birthday Photography session was just to die for! 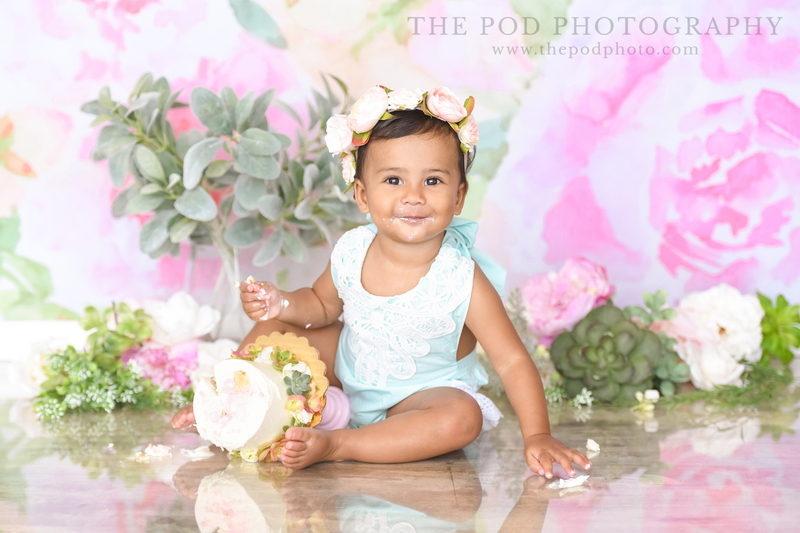 We loved each and every set up – and we especially loved Beautiful Miss Maya!! 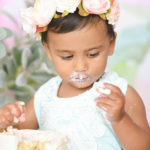 Her cuteness made everything look ten times better!! 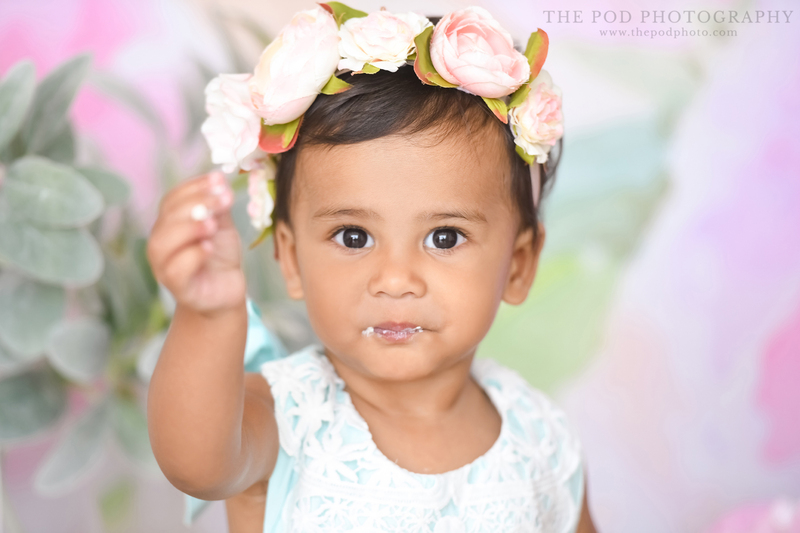 Give us a call at our Westchester First Birthday Photography studio at 310-391-4500 to set up a consultation with your photographer. 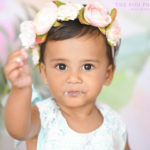 Follow us on our Blog, Facebook, Instagram and Google+ to see what we’ve been up to, or explore our YouTube page for more!